News: Doug has recently sold Space Station Down, a collaborative novel with Ben Bova to Forge Books (Macmillian publishers), via his agent John Silbersack (The Bent Agency). Space Station DOWN is Doug’s 18th book and is scheduled for a July 2020 hardback release. Kill Zone, Doug’s collaborative novel with Kevin J. Anderson is scheduled for an August 2019 hardback release from Forge Books. From the KILL ZONE jacket: “Deep within a mountain near Albuquerque, New Mexico, a Cold War-era nuclear weapons storage facility is being used to covertly receive deadly high-level nuclear waste from across the US. “Only Department of Energy employee, Adonia Rojas, and a few others including a war hero, a senator, and an environmental activist, are allowed access on an inspection tour. But Hydra Mountain was never meant to securely hold this much hazardous nuclear material, and it has the potential to explode, spreading radioactivity across the nation. Doug’s article ‘War at the Speed of Light,’ was published in There Will Be War, Vol. X, Edited by Jerry Pournelle. Doug’s short story, ‘Thunderwell,’ appeared in Carbide Tipped Pens, edited by Ben Bova and Eric Choi, published by Tor. Doug is currently at work on a science-based thriller, The Carrington Collapse. 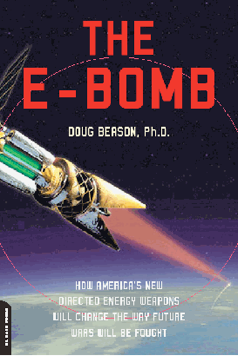 The Kindle version of The E-Bomb, Doug's non-fiction book on Directed Energy weapons, was released by Da Capo Press. He has lectured on The E-Bomb at the Carnegie Council, the Heritage Foundation, on C-Span, and numerous radio shows and live web-sites such as Coast-to-Coast. "… a spirited defense of these new weapons and their likely impact on the battlefield … a solid introduction to directed energy weapons." "The most comprehensive and up-to-date depiction of the revolutionary change that is about to happen." "Directed energy is the wave (and not just the microwave) of the future, the source of weapons that will prove to be revolutionary … will appeal to readers schooled in Tom Clancy."